North Carolina’s top 1 percent are doing quite well, according to research by the Economic Policy Institute that provides a unique view of income inequality by comparing the incomes of the top 1 percent to the bottom 99 percent in states and counties across the country. 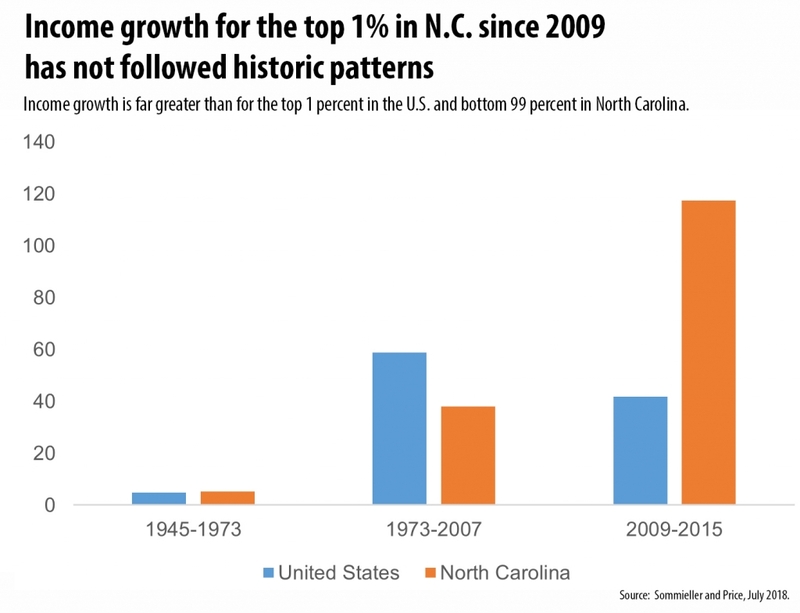 Since the recovery began in 2009 until the last available data in 2015, the top 1 percent in North Carolina have captured more than all of the income growth. How is such a thing possible? When the income of the bottom 99 percent of North Carolinians declines over the same period. Those two staggering facts should be enough to give us pause that something is truly wrong with how our economy works. But there is more data from the Economic Policy Institute for a shorter time period (2010 to 2015) due to data availability at the county level that shows that income growth for the top 1 percent maps to geographic inequities in North Carolina. In the state’s urban counties, the top 1 percent have incomes that are 23 times that of the bottom 99 percent, whereas in the state’s rural counties that ratio is 14 times. Twelve counties saw the income of the bottom 99 percent of North Carolinians in those communities decline. For these communities, the stabilizing force of people spending locally and building assets is weakened and, with it, the potential for the community to thrive. It doesn’t have to be this way. North Carolina’s recent history shows that income growth for the top 1 percent doesn’t have to be out of balance with what is happening nationally nor does it have to so significantly outpace that of their neighbors in the bottom 99 percent. The recent period has been a very different recovery for many reasons: Job growth has been slow, wage growth is nearly non-existent, and poverty has remained persistently high. It has also been a period when our state has experimented with tax cuts that primarily benefit the wealthy. That tax cut for the wealthy experiment has failed. It hasn’t delivered a remarkable economic boost. Instead, it has undermined the foundations of our economy by forcing cuts to programs and services that have the long-run potential to help our families and communities do well. Now, perhaps, there is also a sign that it is failing to counteract the growth in income inequality that threatens long-term growth and the fabric of communities. In light of this recent data on income inequality, the prospects of capping the maximum income tax rate at 7 percent in the state constitution should raise the concerns of every voter. Such a move would cut off a key tool for investing in every North Carolinian’s economic well-being while also consolidating the gains of millionaires by shielding their higher income from a higher tax rate. In recent years, that kind of graduated income tax rate on income over certain thresholds has been critical to stabilizing state budgets in downturns, protecting local governments from cost shifts, and ensuring that children and families aren’t faced with cuts in programs or services. It is a tool that future policymakers and voters should be able to choose when they need to focus on the well-being of all North Carolinians.